The King Abdullah Finance District (KAFD) is a 45,000 sqm metro station in Riyadh, Saudi Arabia. It’s complex geometry forced Zaha Hadid Architects to develop their bespoke software to model the project. The aim of the station will be to become an essential interchange between three metro lines, including six platforms over four public floors and two levels of underground car park. The project will be combined with the local financial district and multimodal transport connections, adding various pedestrian trails created to improve the flowing and a sky platform that will provide access to a local monorail. This station is one of the 100 from the expanded Metro circuitry being handed into BIM Level 2. Revit and IFC BIM Models, that meet LOD 350, will be given to the client on achievement as a contractual condition. Both the facade and roof design of the building include a series of undulating waves, inspired by the complicated natural trims in sand dunes, and convex lattice screens that emulate the ancient Arabic art form of Mashrabiya. According to the architects, it is a three-dimensional lattice defined by a chain of opposing sine waves. 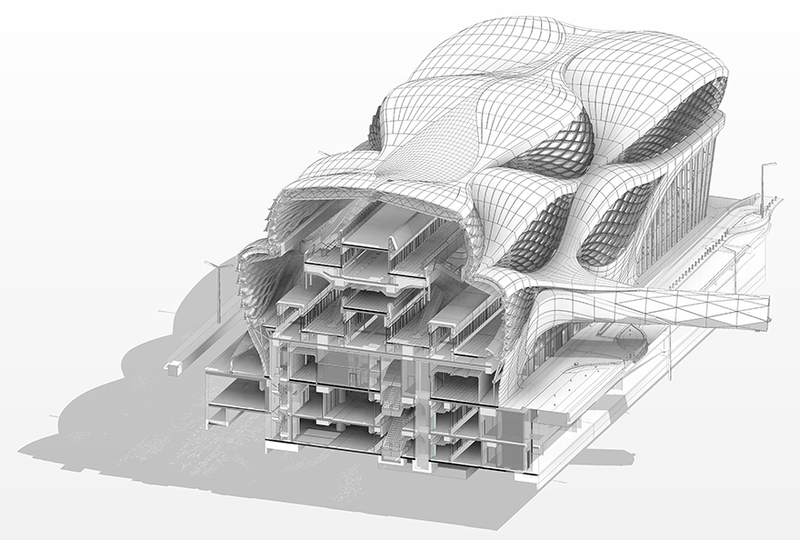 This complicated and rounded geometry was impossible to model in Autodesk Revit, so the Zaha Hadid Architects team decided to develop their own bespoke BIM software to work with it. The architectural design started with the modeling software Maya, from there it was turned into a flat polygon meshes and imported into the CAD package Rhino, linked to the surface modeling software T-Splines. With the bespoke software, Zaha Hadid Architects made the necessary changes to the information in order to create a flat and exact geometry that could be laid out in Revit. The fabrication detail in the model stands out all services and linked metadata necessary to achieve the contract agreements. This innovative workflows developed by Zaha Hadid Architects will be presented at Autodesk University in London and Los Angeles this year. BIM was mainly used in the construction of KAFD to save money and time on site. 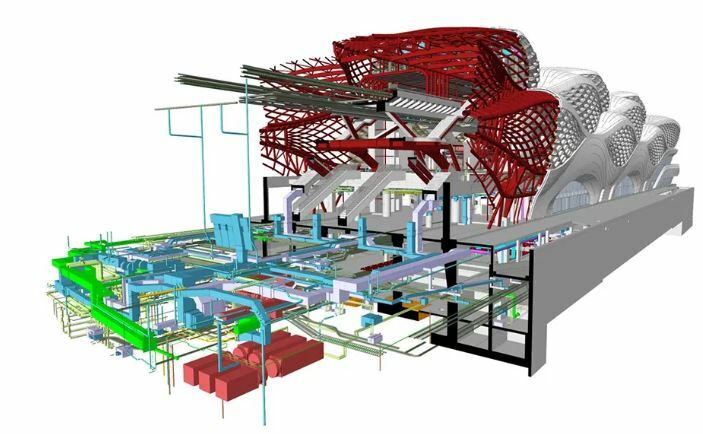 There was necessary to create an extensive BIM Execution Plan because the client required data compilations at specific milestones to ensure the project schedule did not fall behind. The ArRiyadh Development Authority plans to use the fully coordinated model, including the architecture, MEP and structures along the lifecycle of the building, and the use by its facilities management teams. No matter how it might look, the project has not been all plain sailing. It took more than a year for the team to become familiar with BIM and to share information because some of the companies enrolled in the project have never used BIM before. 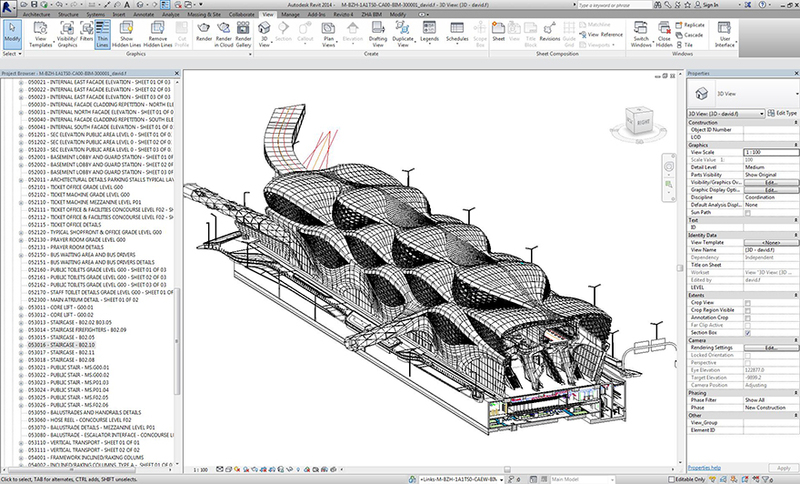 The MEP contractor tried to model in 2D with AutoCAD, trying to create a model but the fluid nature of the building made this approach impossible. Especially, after seeing the ducts and conduits flying out the facade and the slab. The early clash detection process with Naviswork create a large number of clashes, but on the second stages of delivery, this number was reduced to a zero at +/-0.10 mm tolerance. 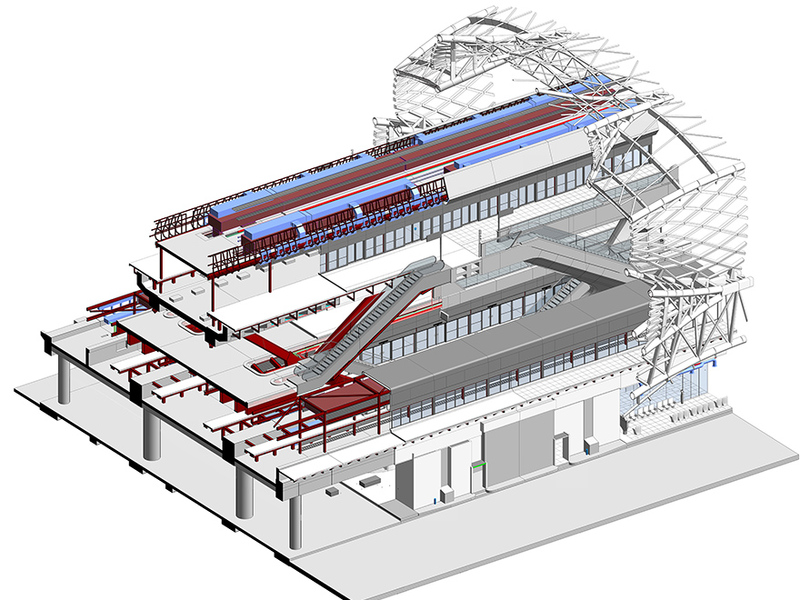 The main benefit of working with BIM has been to decrease the project risk because the team was able to deliver a complete federated and coordinated model in a soft stage, including MEP and structures, which provided the client and contractor a greater reliance in the building. The project is currently on site and the main contractor is using 4D and 5D BIM processes to plan sequences of work and calculate the value of materials. The project will be finished in 2020.